Tom Petty has been in and out of the spotlight since the beginning of his musical career. But Petty has the right to the rewards and respect that he is finally getting. With his new hit album, Full Moon Fever, Petty has finally achieved the quality and sincerity that he has been looking for in his music. Although, on the album, he doesn't play with the Heartbreakers, he wouldn't think twice about not touring with them. The Heartbreakers are Petty's equals, and when they play together they play as a whole, as they did Wednesday night, when they took the stage, at the Nassau Coliseum, as a full and complete force. They came to do one thing, play music. There wasn't a fancy light show nor was the band jumping around like a circus act; this just isn't Petty's style. He is laid back and portrays a very relaxed image, and his music compliments this. 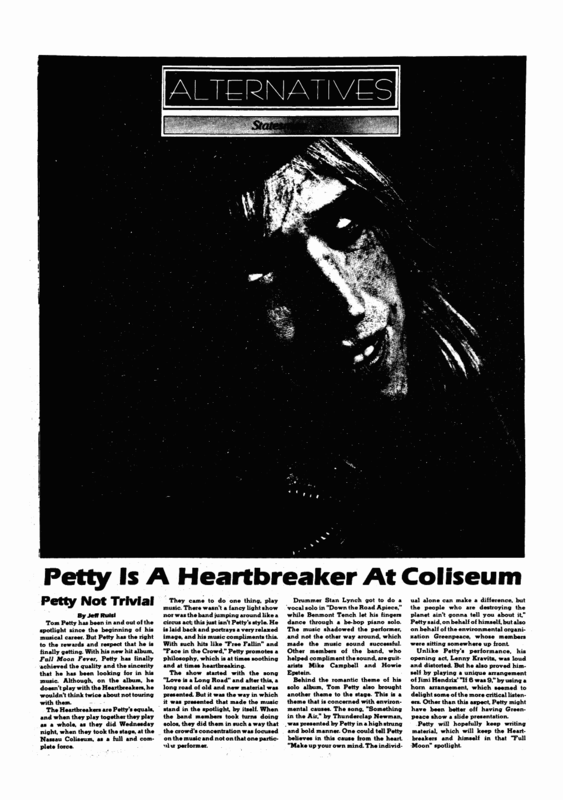 With such hits like "Free Fallin'" and "Face in the Crowd," Petty promotes a philosophy, which is at times soothing and at times heartbreaking. The show started with the song "Love is a Long Road" and after this, a long road of old and new material was presented. But it was the way in which it was presented that made the music stand in the spotlight, by itself. When the band members took turns doing solos, they did them in such a way that the crowd's concentration was focused on the music and not on that one particular performer. Drummer Stan Lynch got to do a vocal solo in "Down the Road Apiece," while Benmont Tench let his fingers dance through a be-bop piano solo. The music shadowed the performer, and not the other way around, which made the music sound successful. Other members of the band, who helped compliment the sound, are guitarists Mike Campbell and Howie Epstein. Behind the romantic theme of his solo album, Tom Petty also brought another theme to the stage. This is a theme that is concerned with environmental causes. The song, "Something in the Air," by Thunderclap Newman, was presented by Petty in a high strung and bold manner. One could tell Petty believes in this cause from the heart. "Make up your own mind. The individual alone can make a difference, but the people who are destroying the planet ain't gonna tell you about it," Petty said, on behalf of himself, but also on behalf of the environmental organization Greenpeace, whose members were sitting somewhere up front. Unlike Petty's performance, his opening act, Lenny Kravitz, was loud and distorted. But he also proved himself by playing a unique arrangement of Jimi Hendrix "If 6 was 9," by using a horn arrangement, which seemed to delight some of the more critical listeners. Other than this aspect, Petty might have been better off having Greenpeace show a slide presentation. 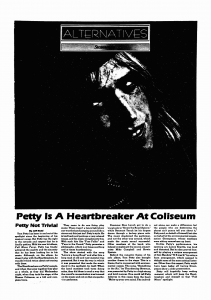 Petty will hopefully keep writing material, which will keep the Heartbreakers and himself in that "Full Moon" spotlight.